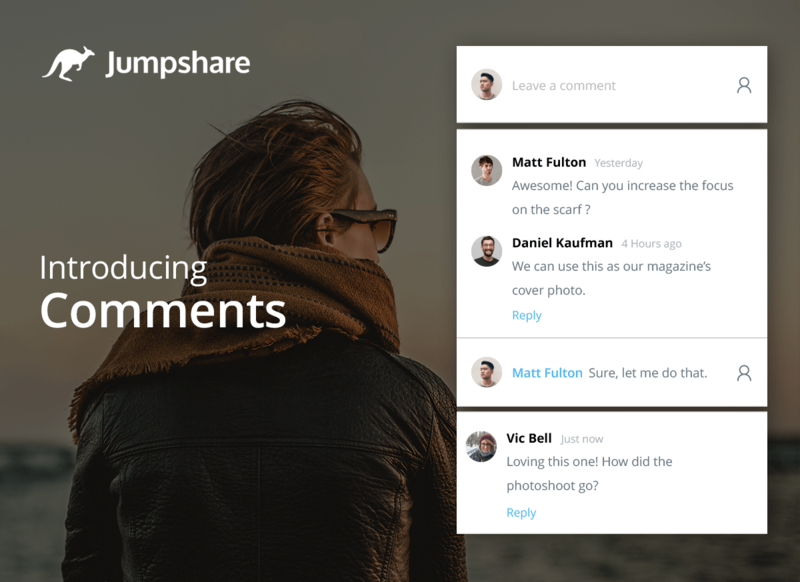 The Jumpshare Blog - Page 2 of 11 - Re-imagining the way people upload, share and interact with their files. Creative professionals use Jumpshare because it makes sharing effortless. To get feedback however, they have to switch to others apps and services like email, or messaging platforms like Slack and Skype. This means the feedback and the files are residing in two different places. To streamline all this, we are introducing Comments; now you can get feedback directly on your files. Jumpshare is used by thousands of professionals spread across diverse industries to quickly share files and collaborate with their teams and clients. Part of the collaboration process is to take the project from concept to completion. This means making hundreds of revisions to a file before it reaches the final result. We’re excited to release the next version of Jumpshare v2.2 for Mac to the general public. This release adds support for macOS Sierra and comes with a slew of new features, including GIF Recording, Version History, and new Annotation tools. Every time your shared file is viewed or downloaded by recipients, we notify you via email and send you push notifications to your desktop apps and iPhone app. 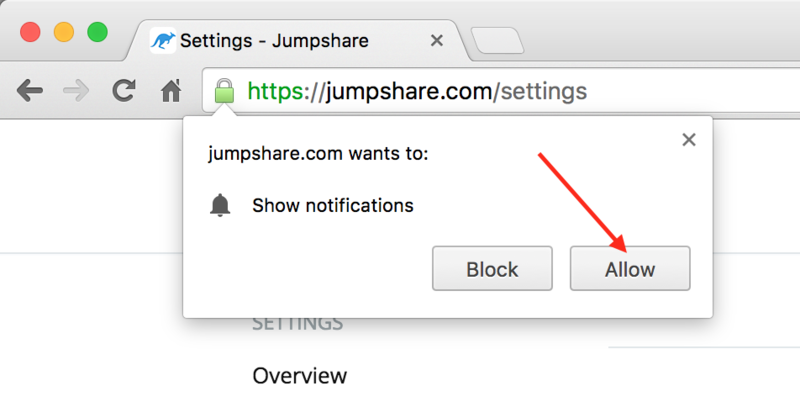 We also send notifications when any Jumpshare user shares files with you. However, if you’re using the web app, there is no way to get notified in real-time. That changes today! We’ve now added support for desktop notifications for every major web browser, including Chrome, Firefox, Safari, IE, and others. Once enabled, you will be receive notifications every time there is an activity in your account. Desktop notifications allow to work and respond faster, and helps you make Jumpshare an integral part of your workflow. 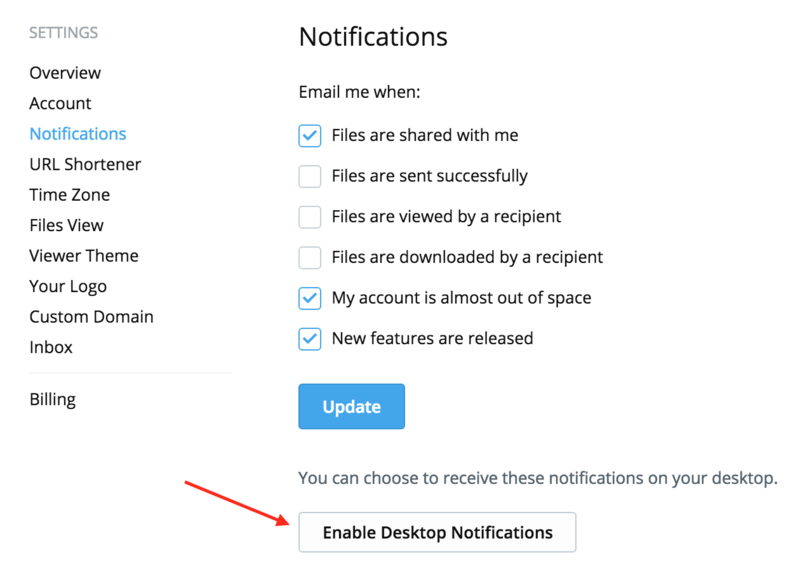 To enable desktop notifications, visit the Settings page and under Notifications section, click “Enable Desktop Notifications” button. Once done, your browser will ask for your permission, click “Accept”. If you want to stop receiving desktop notifications from your browser, just click “Disable Desktop Notifications” button under Notifications. 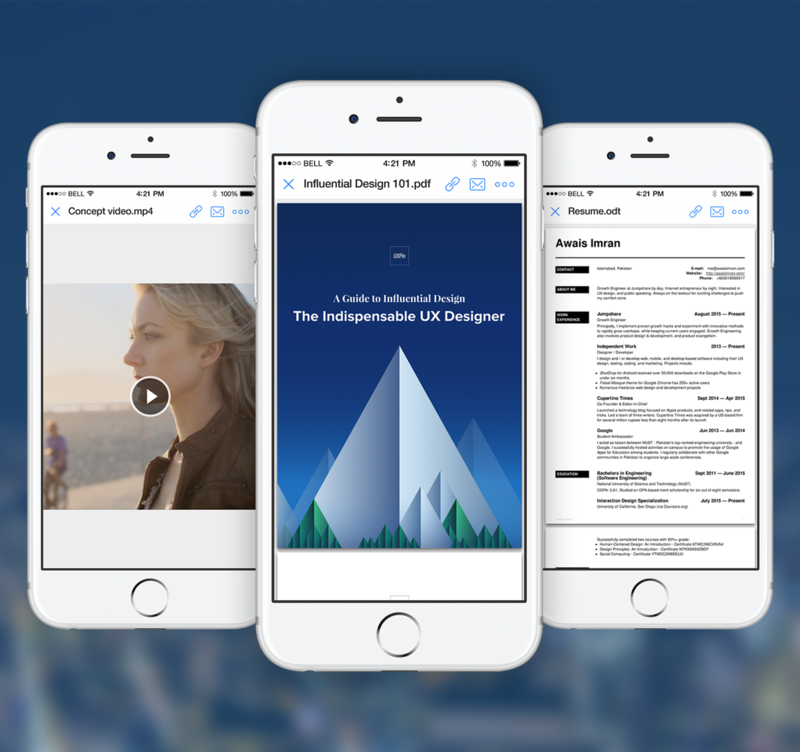 Today, we’re delighted to introduce Jumpshare for iPhone – the world’s first real time file sharing app. You can immediately share your files with a link, or via email without waiting for uploads to finish. It also comes with a powerful file viewer, advanced sharing options, and useful tracking features which help you work smarter and be more productive on the go. Sharing a file with Jumpshare is at least 3x faster. This is an incredible improvement over existing file sharing apps which require you to wait until files are uploaded before you can generate a shareable link. Jumpshare is designed for instant sharing. You just open the app, select files to upload, and share them right away. There’s never any waiting involved! The real-time nature of Jumpshare makes file sharing a near-invisible component of your daily workflow, helping you remain focused on your work. Your recipients enjoy the same seamless experience. Uploading progress from your end is shown in real-time, and files are loaded the moment they’re ready – no page refreshes required. 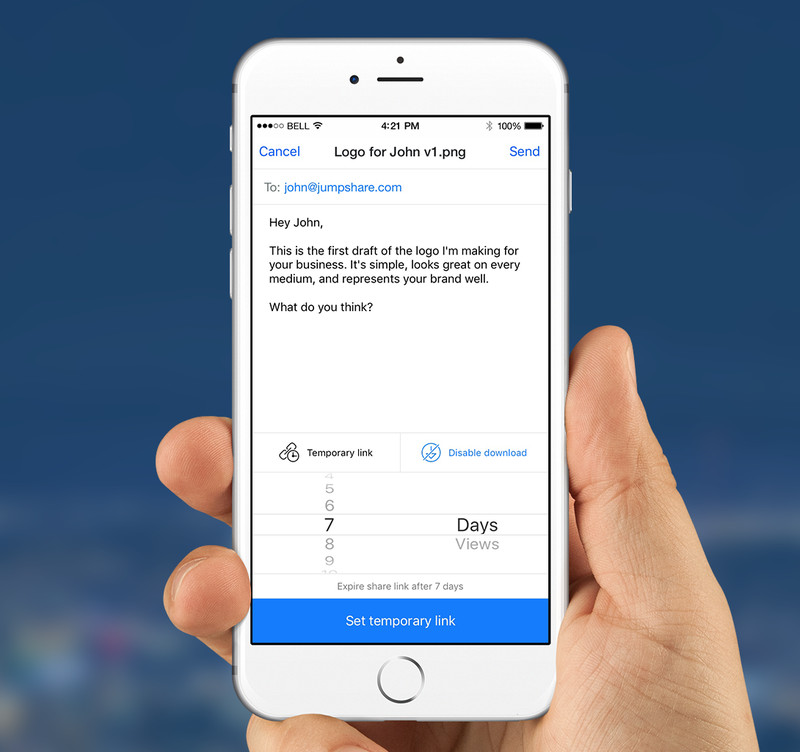 What’s more: after sharing files, you can smartly time your follow-ups with recipients because Jumpshare sends push notifications when they view or download your files. File sharing works particularly well when everyone can easily open and view files. So, delivering a powerful file viewer which goes beyond the basics was one of our biggest tasks as we developed the app, and we are proud what we have achieved! Jumpshare can open over 200 file formats – a number unheard of in the mobile space. Everything you work with on a daily basis can be previewed flawlessly. From documents, photos and videos to code, fonts, Markdown, and Photoshop/vector files. 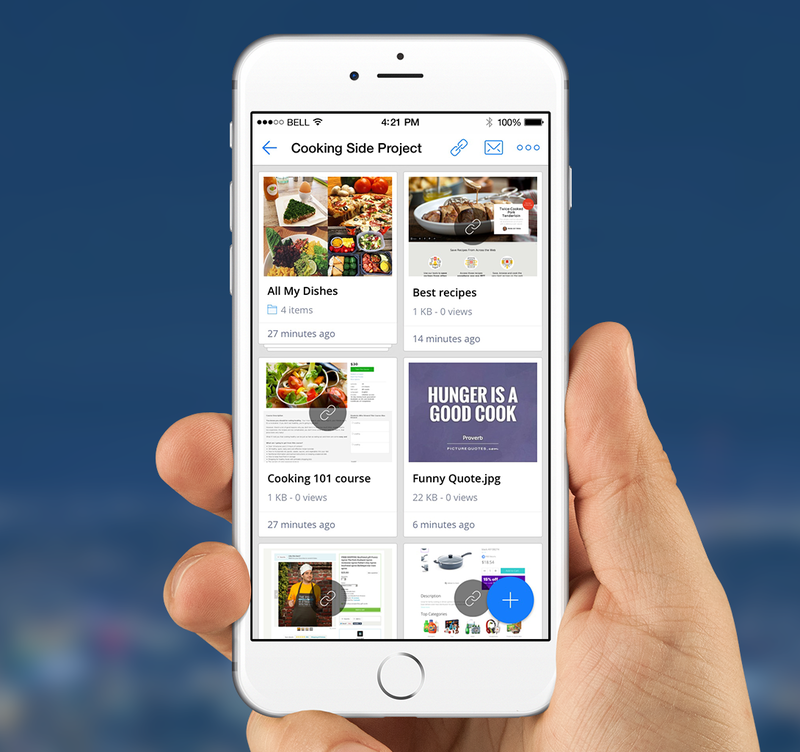 Whether you’re using the iPhone app, or viewing shared files on mobile, or desktop, the days of installing separate apps for different file formats are over! Stumbled upon a funny video, or an important article? Save it for later with the Bookmark option. You can also use our link shortener to share and track how many times your link has been viewed. What’s more: you can directly upload files you find online to your Jumpshare account. Just bookmark the file’s URL, and our servers will fetch and upload the file for you! 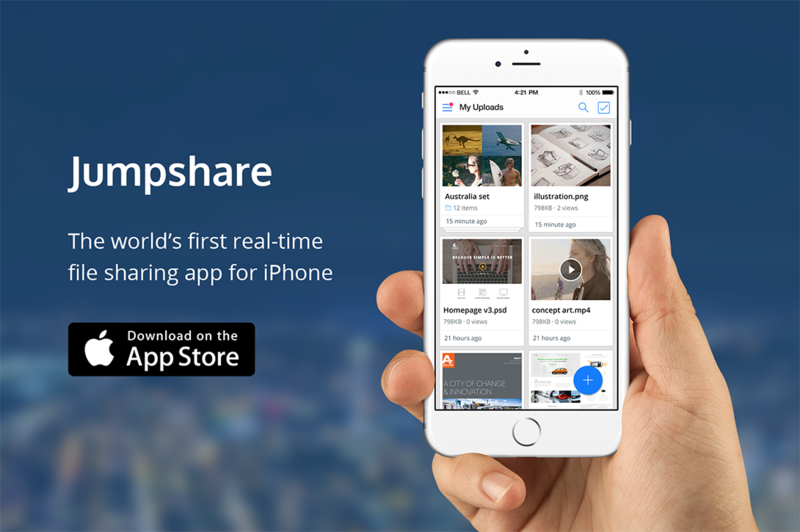 Jumpshare is the world’s first real-time file sharing app for mobile, and the last mobile file sharing app you will ever need. We’re incredibly excited about launching it today, and simply cannot wait to show you what we have in store! We have just released version 2.0.3 of Jumpshare for Windows. The version number may suggest a minor update, but you should know this is a major upgrade in terms of reliability. We’ve fixed a large number of bugs throughout the app, thus making for a significantly improved file sharing experience. You’ll need to grab the latest version from our website. This is because the previous version was accidentally shipped without an automatic updater which has been fixed in version 2.0.3. New: A powerful new updater that will automatically download the latest version of Jumpshare, and allow you to install it on your next relaunch. New: System/Network administrators can now deploy Jumpshare on all PCs in their organization. Fixed: Jumpshare would crash after waking up from sleep. Fixed: Users without administrative rights were unable to install Jumpshare on their PC. Fixed: Clicking on a file would open the Jumpshare.com link in Internet Explorer if the default web browser wasn’t Chrome, Firefox, or Opera. Dozens of other stability improvements, as well as minor UI tweaks.